Iris is a huge genus, containing about 300 species and thousands of cultivars that flower in nearly every color of the rainbow. 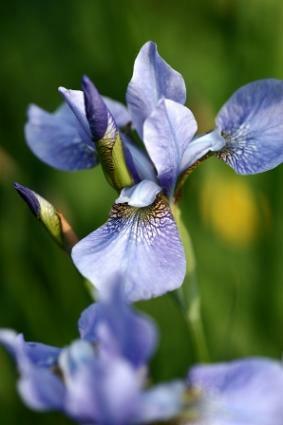 Among the easiest perennials to grow, iris will reward your minimal efforts with their magnificent blooms. The most commonly grown types are bearded and Siberian. The Japanese is another species to try. Bearded varieties comprise the largest selection of cultivars available. The many hybrids produce distinctive flowers in mid-spring and early-summer. Bearded are known for their "beards" of hairs in the center of each lower petal. They grow from thick, fleshy roots called rhizomes. Bearded irises require full sun. They like well-drained soil with plenty of organic matter. Prepare the soil by working organic matter such as compost into the top six inches of soil. Plants can be planted as container-grown plants in spring or as bare rhizomes in fall. When planting, cover the rhizomes with about an inch of soil and pack the soil solidly around them. As they grow, the rhizomes will come to the surface; established rhizomes of the bearded type normally lie just at the surface of the soil. Most varieties need to be divided every three to four years, when the rhizomes become overcrowded. The best time to divide is between one and two months after bloom season, usually in July or August. To divide the plant, cut the newer parts of the rhizome free from the old. Discard the old rhizomes and replant the new. You will probably even have enough rhizomes to share with your neighbors. Unfortunately, the flowers are not very long-lasting. Plant tulips, daffodils, or other early spring bulbs to bring interest to iris beds at the start of the season. Low-growing sedums or phlox look good planted around medium-height bearded varieties. Perennials such as columbine, false indigo (Baptisia), and daylilies complement the later-blooming irises. The American Iris Society has devised a six-group classification system to deal with the more than twenty thousand bearded varieties. They are grouped according to their bloom times and heights. Miniature Dwarf Bearded (MDB), for example, are the smallest and earliest-blooming of the bearded varieties. Tall bearded (TB) are the group probably best known to gardeners. They are more than 27 inches high and are the last of the bearded to bloom in late spring. Siberian (Iris sibirica) is the easiest of all to grow. They form lush clumps of long, grasslike leaves and are covered with blooms for a short time in the early summer. Flowers are mostly in shades of blue and purple, and white. They have excellent disease resistance. Siberian grow in full sun to part shade and in well-drained, moist, or even constantly wet soil. They look great planted at water's edge. Plant them with their roots fully covered with about 2 inches of firmed soil. Siberian don't require frequent division like bearded varieties do. Clumps of Siberian flowers can remain in good condition for 10 years or more. Divide them when the center of the clump starts to look dead or when they're no longer blooming well. Divide Siberian varieties in the early spring or fall. Perennials that make striking companions for Siberian stunning flowers and attractive foliage include lady's mantle, peonies, false indigo (Baptisia), coral bells, and catmint (Nepeta). Japanese (Iris ensata) have large, spectacular blooms that appear about a month after bearded flowers bloom. Japanese types are well suited to bog gardens or the edges of a pond or stream. They thrive in moist, rich soil in full sun or part shade. Clumps should be divided every three or four years in early spring or fall. Many beautiful varieties are available, including 'Variegata', which has large purple flowers and strong leaves in cream and green. With bearded varieties especially, it's important to clean up and destroy all dead foliage, preferably in the fall. The foliage can carry disease spores and insect eggs. If spotted, ugly leaves start to bother you late in the season, it's okay to cut them back with a scissors. Otherwise, leave healthy leaves alone. Some of the smaller types can be used for forcing.